Filipino diva Charice, who had a concert last March 9, 2012 at the Araneta Coliseum, shocks her Filipino fans when she arrived sporting a new look: blonde short hair and a tattoo on her left forearm. The 20-year-old explains why she changes her good girl image into a more edgy look. The tattoo which she got in Singapore says “Love Eternally” with an infinity sign in the middle. 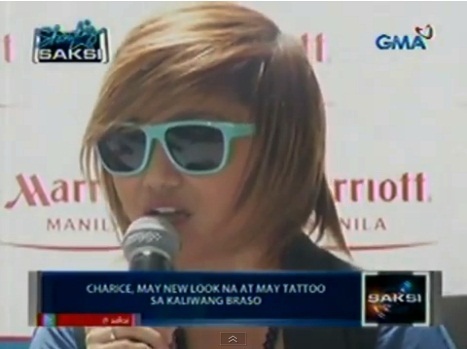 With her boyish hair and tattoo, her critics are out once again saying that she looks like a lesbian and even compared her new look to Aiza Seguerra, a Filipina singer who is openly a lesbian.